We only know of one planet where life exists. However from the evidence of the existence of extra solar planets and proto-planetary discs most scientists believe that there are perhaps a few other worlds in many ways similar to our own beautiful Earth. As previously mentioned, it seems that in order for life to flourish it is necessary to have liquid water. It would at first sight seem to be that the planet must orbit its star in the habitable zone. However there are other possibilities. Taking as an example, Europa one of the moons of Jupiter. Because of its large distance from the Sun, Europa is totally encased in ice. However, it is believed that under the ice there is a huge planet-wide ocean of liquid water kept warm by the tidal energy supplied mainly by Jupiter and also by the other three moons - Io, Callisto and Ganymede. Callisto and Ganymede themselves as well as the moons of Saturn, Titan and Enceladus may also have hidden oceans beneath their frozen surfaces. Perhaps there are or were thermal vents on the floor of the moon beneath a deep ocean. It is also possible that gas giant planets may be accompanied by large Earth-sized moons within the habitable zone of a parent star and thus able to sustain a biosphere. This has already been mentioned in the page on star systems with respect to one of the smallish gas giant (about 25 Earth masses) that lies within the habitable zone of 55 Cancri A. It formed the basis of the recent (2009-2010) 3D film Avatar where the people lived on Pandoria, the large moon of a gas giant planet. It is problematical whether or not low mass stars known as red dwarfs may play host to life-bearing planets. Any planets in the 'habitable zone' might be so close as to be tidally locked - that is to say always turning the same face towards the star. There are varying opinions but some authorities think that given the right set of weather conditions and ocean currents such planets may be able to maintain liquid water on the night side as well as on the day side. It is therefore highly likely that quite a large number of worlds exist where the chemistry of life has evolved. However taking our own Earth as an example, the process of evolution would seem to take a very long time. We can not of course be sure that the very slow rate of evolution on our own planet is a hard and fast rule. Over the four and a half billion years of the Earth's existence life is thought to have begun around 3,800 million years ago. However it was only about 544 million years ago that the Cambrian Explosion took place when very suddenly, in the geological time scale, advanced multi-cellular animals began to evolve and it was only because of the existence of continental land masses that life began to conquer the land. As far as we can tell human-type intelligence only appeared about 200,000 years ago and technological civilisations around 10,000 years ago. The dinosaurs and even the most intelligent mammals did not evolve a highly technological civilisation. It may therefore be that, although our planet may not be the only example, technological civilisations may be quite rare in the Universe. The other fact with regard to intelligence that it was also slow in developing. On the other hand we have no means of knowing whether it is inevitable. It is true that apart from us, apes, monkeys, elephants, dogs, dolphins,whales,horses,crows, parrots together with certain other creatures including some cephalopods (the octopus and the squids) also show considerable intelligence. Between April and July 1960 Frank Drake turned the Greeenbank Radio Telescope towards the heavens to listen for radio signals emanating from an alien civilisation. He chose as his targets two nearby sun-like stars, Epsilon Eridani and Tau Ceti. The choice was dictated by the relative nearness of the two stars and the fact that they similar to the Sun although a little lower in mass and luminosity. Epsilon Eridani as we have learnt in page two of the website is far too young to have a planet where advanced life has taken a hold. In contrast Tau Ceti is a much older star and is, despite this fact, surrounded by a vast cloud of comets and asteroids which could result in heavy bombardments of any planet in the system. Nevertheless it could have a planet in the habitable zone about as close as Venus is to the Sun It was the beginning of the radio search for civilisations beyond the Earth and was nicknamed project OZMA after the Princess who lived in the land of Oz. The NEW Greenbank 100 meter radio telescope is shown on the left above (Illustration Credit NROA	NSF). The new telescope set up in 2002, since the original 300 Foot radio telescope which was used in the OZMA experiment collapsed at 9:43 PM on November 15, 1988. Later the experiments that Drake had pioneered were formalised into an organisation called SETI. Since then the SETI Institute using massive radio telescopes has been combing the skies for an intelligent signal from a planet in another star system. One of the telescopes used in the project is the largest single dish radio telescope in the world. 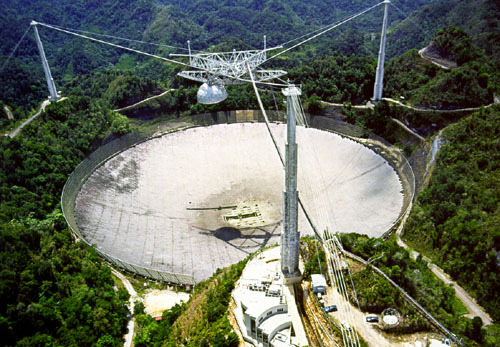 It is located at Arecibo and is set in the tropical jungles of Puerto Rico. It operated by Cornell University for the National Science Foundation. It came into operation in 1963. 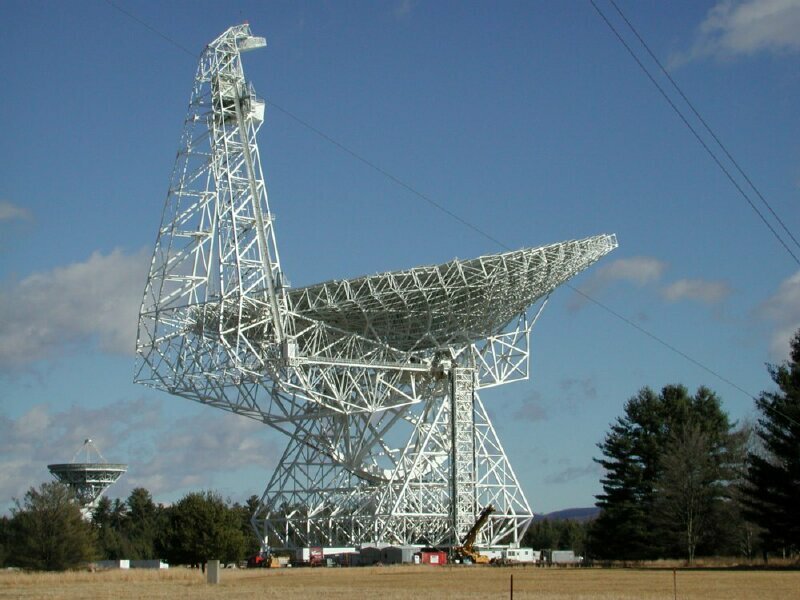 Among other things it has been used by SETI and features in the film 'Contact' by Carl Sagan.